I'm finding stray dog friends all the time now. This happy guy was ready to join us inside the Main Press Center. Some days at the Olympics are as wild as a snowboard-cross race. We had one of those days in Sochi on Saturday. The U.S. and Russia played one of the best hockey games in Olympic history. At the same time we had writers chasing the story of a 23-year-old Russian women's ski-cross skier who had reportedly suffered a horrific spinal injury—a dislocated vertebra, almost certain to cause paralysis—in a training crash on a course that might have been too dangerous. Then one of our staff members, writing on deadline, received a message that his wife was in the hospital after suffering a possible stroke. Throughout this we were negotiating with athletes and agents and the IOC for a potentially amazing photo shoot. And so on. 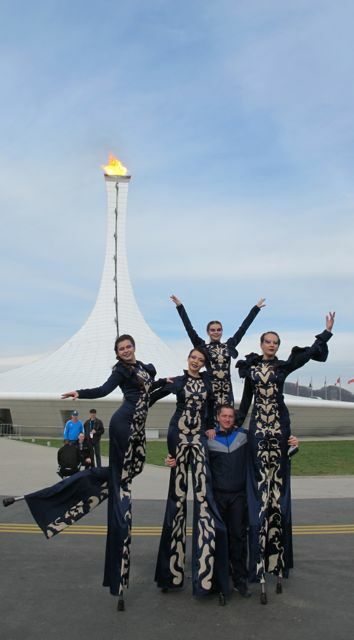 Olympic Park has become a festival of ethnic culture, music and dance. Every day at the Olympics is at least a little like that. The Games pack into two weeks more life-changing, career-altering, mind-bending stories and moments—tragedies and triumphs—than any person would normally see in a lifetime. If you're here as a journalist, it all comes at you fast. The so-called Ded Moroz Residence in the park celebrates the Slavic version of Santa Claus, a jolly, white-beared, red-suited figure who gives out presents on New Year's. I walked in on a performance by a group of Circassian dancers called The Legend of the Caucasus. Etremely long sleeves seemed crucial to the choreography. These native peoples from the Arctic were playing mouth harps near a display of their teepees and animal furs. This is Russian Flag Man. This may be the coolest attraction in Olympic Park. Fans have their faces 3-D scanned, then watch the faces appear in actual 3-D on a big screen. Here's the, um, head-on view. Everywhere you walk, there's a different group of dancers. One of the baked-potato stands. Necessity is the mother of Olympic invention. When some of our photographers failed to bring light modifiers to soften the illumination from strobes, our crew fashioned homemade ones using duct tape, plastic grocery bags and empty bottles from the office water coolers. We've used remote-controlled cameras at sports events for years, but here we've moved to a new level—we can aim and shoot pictures at distant venues from our office in the Main Press Center. Some of the photos at a future Olympics could be shot by a staff member back in New York using this type of hookup. On the laptop above you can see the camera view of the speedskating venue. Churchill famously called Russia a riddle wrapped in a mystery inside an enigma. This confection was an unidentifiable riddle of a jam wrapped in dry cake inside pink frosting. But pretty good. I do like cookies. One last shot from Olympic Park. I love the translation.